Outdoor skating in sunny California — how does that work? I went to San Francisco’s Embarcadero rink last week, to check it out. For years I had heard friends talk about it, but I was skeptical, having grown up in Wisconsin where freezing temperatures were always part of the package. 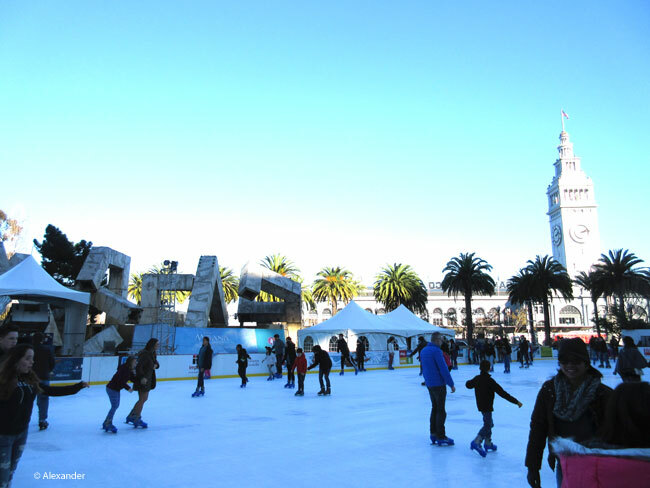 Ice skating in San Francisco includes mild temperatures, sunshine, and palm trees. The rink is portable, installed every November for the holiday season. Aluminum segments measuring 3×30 feet are assembled, accompanied by tents offering skate rentals and storage lockers. There is a company who specializes in temporary outdoor skating rinks, they service cities around the world. Then sometime after New Years Day it all comes down until next November. For $11 per person, it offers excitement, exercise, and a few wobbles and tumbles at no extra charge. San Francisco Embarcadero Ice Rink photos and info. It so popular that skaters have to make reservations, are committed to a timed session. Music is pumped in and a Zamboni smoothes the ice in between sessions. In Wisconsin, we skated on huge expanses of frozen lakes and ponds; and quickly figured out where the smoothest ice was. Every winter my father also rolled out plastic sheets and transformed our dormant vegetable garden into the neighborhood ice rink. So to me the outdoor rinks in California seem odd; but the Zamboni, after all, was invented in California. 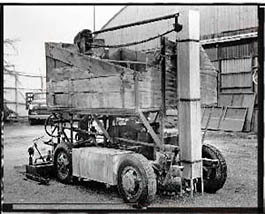 The first Zamboni. Courtesy Zamboni Ice Resurfacers. The ice-smoothing machine was invented in the Los Angeles area by two brothers and their cousin, the Zambonis, in 1940. They used the Ford Model A as a prototype. Ice melts in warm weather, but the magical Zamboni comes along and scrapes the chips and fills in the gaps. It’s a real science, making ice, read about it here. Personally, I had enough of cold weather to last me a lifetime. It was fun as a kid, but then I grew up; drove my first car across an ice patch into a concrete wall, lost a million mittens, and was always freezing. So when I got old enough, I moved to California. Still, the snow is pristine and hushing, and creates some of the most lovely vistas. I still find it beautiful to look at. I like to watch the ice skaters circling the rink, I like to look at beautiful photos of snow, and I like traveling to the tropics. It’s a wonderful world, having these options. In case you want more of San Francisco, I know a good book written by someone I know. Oh yeah, me. That’s pretty interesting. I thought you were going to remind us of Northern California as a joke or something. Squaw Valley or Tahoe perhaps. Interestingly, the outdoor skating rinks exist in Los Angeles and San Diego too — seems like a joke, I know. Thanks, as always, for stopping by, Craig. Thank you, Zamboni boys! And thank you Jet, for the link. I was at the hockey a couple of days ago, and like always, got to wondering how the Zamboni works. Now I know! 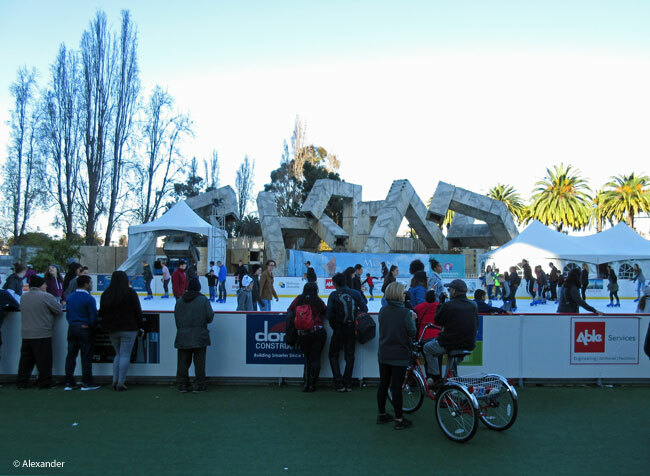 Outdoor ice rinks pop up in quite a few of our cities in the UK around Christmas these days – though none in temperatures as warm as California! I do enjoy ice skating now and again and there’s something special about doing it outdoors – I’ve never had the opportunity to do it on a frozen lake 🙂 I was feeling the warmth of the Australian sun as the year ended and I finished a ‘wicked walkabout’. 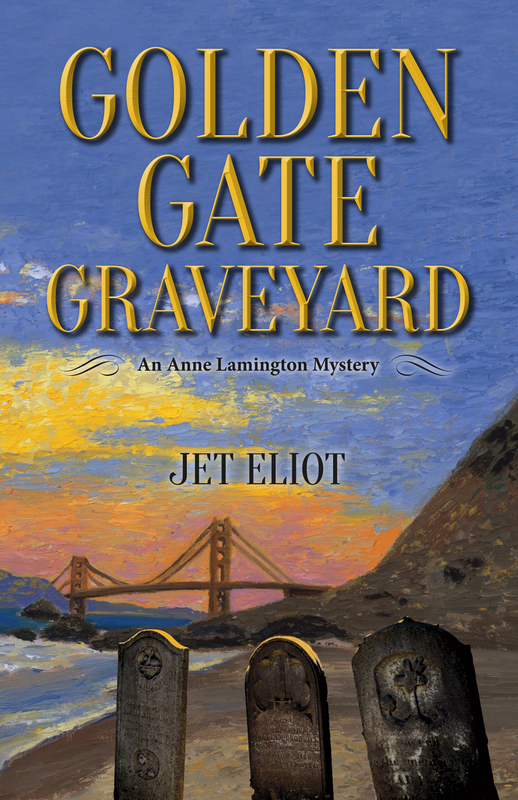 Loved reading this one too Jet and I’ve left reviews on Amazon and Good Reads. I followed a few of the links you provided. Thanks for the plug 🙂 I hope it snows her soon. I miss the snow. I learned to ice skate at an indoor rink in Kensington, London. I loved reading where you learned to ice skate, Sherry; I think it is one of those life experiences that stays with us. It was a treat to share your pensive Hudson River photos, Sherry — and I hope your wish for more snow comes true. I hope all your wishes come true…. San Francisco is a lovely city of many opportunities and activities and now they have an outdoor ice skating arena. How fun for northern Californians to exercise their legs on ice and at the same time enjoy the spirit of Christmas holidays. It is just that combination of exercise and festivity, SWI — I’m glad you enjoyed reading about it. In SF there is also another outdoor rink in Union Square, it is a little smaller (I hear). Bay Area residents make comparisons and talk about which one rents better skates (apparently it’s the Union Square rink). Thank you for stopping by today, my friend — and best wishes for a wonderful new week in this new year. A honeymoon in SF and you’re still together after 56 years — that’s a great honeymoon city! Thank you, SWI, for your visits and comments and kindness. Fun to hear about your daughter’s annual ice skating adventure, too. As a lifelong coastal Californian, I’ve had to embrace those outdoor rinks as the only game in town… There are many in the LA area – and I even felt a bit guilty that, while much of the country gets inundated with snow, I had it sprinkled down onto me from a machine at Disneyland as the finale to an attraction. In the end, I think ice and snow are magical however they come to be! Enjoyed your ‘Song of Ice and Zamboni’s!’ Thanks for sharing! I completely agree with you, Amy. I have learned to keep quiet when folks are sharing their traumas of the polar vortex. Then I think about the natural disasters we have here in Calif. and justify that it all balances out. Kind of a funny way of thinking that I know is not unique. haha. So glad you stopped by and shared your comment. glad people are skating in SF, Jet! up, nearby in ukiah, also. I’m so glad people are skating, too, David. In fact I was delighted to notice that they were all so much involved in this sport that I did not see one cellphone!! I had to chuckle at the “snoopy rink,” my friend; not because of the unhappy ankles but because I took enough hard cracks to relegate myself to the sidelines too. Yours in upright adventures — and smiles to you for a spirited new year. I do, Bill, I do love both. Today I was telling Athena about some of the Zamboni backstory, that they had an ice rink in L.A. called “Iceland” and wanted to figure out a more efficient way to repair the ice. And we realized that that is the very place she skated in her high school days. Funny coincidence. Iceland, BTW, is still there! Oh thank you Dina, I love knowing this tidbit about the Rhine Valley. Danke! Your post brought back great memories to me, Jet. Thanks. Because my family and I lived in the bay area for 20 years, every Christmas we’d visit SF and watch the ice skaters at Union Square, as well as at Embarcadero. My guy grew up in NE, so he could never bring himself to skate in the warm sunshine. Ha Ha. Seems much more ‘civilized’ to me. 🙂 Happy Happy New Year. Jet I remember you pointing this out to us when we visited. It does seem unusual to have ice skating in California i have to say. Yay to the inventors of the Zamboni! I spent my teen years figure skating and it always felt magical to take those first strokes on freshly flooded ice. Yes, Athena and I met a friend for lunch near there last week and walked over to the rink to observe. I like knowing that you spent your teen years figure skating, Sue. I noticed there is a wonderful photo of you in your skates on your site, and your feet and sturdy ankles look very adept. Your Canadian winter outdoorsiness showed up in many posts, I chose the cross-country post because there was so much snow, and I think it’s cool that your mom is out there too. Hoping your first week of 2017 goes well for both you and Dave, Sue. Jet I have to say I am not as sturdy on those blades as I once was. The skates in that photo are my originals from my teen days. Apparently my feet have had their own transformation over the years as getting those skates on is an Olympic sport unto itself! Oh Sue, that’s just too cold for humans…I send you my warmest thoughts, dear friend. I grew up in Reno where many of lakes froze over but the skating wasn’t that good and often dangerous! We did go down to SF and watched skaters this season. It was lovely. Love the stories of your growing up in Wisconsin. You should write more about them! Love you blog! Have a wonderful 2017 exploring the world. What author doesn’t like to hear a request for a growing-up story? Lately I’ve been going back to Wisc. almost every year, so I have some great photos (and posts) about the Horicon Marsh, where I grew up. But I haven’t written stories. I will write a post on that, Andy. Thank you so much for your warm comment and request. You, too, enjoy 2017 in all its glory. Look forward to your post my friend! Best of both worlds, ice rinks and palm trees. Here in eastern Canada it’s all the former! Really enjoyed this wonderful post about the San Francisco version of ice skating, but being from the Midwest it also difficult for me to imagine ice skating without the freezing cold. I haven’t put on my skates in about ten years, but I still love watching ice skating or a hockey game on the lake and I’ve kept my old skates and hockey stick just in case (but thankfully I always remember I’m too old for broken bones). Wonderful post to go along with watching the Winter Classic outdoor hockey games of the Detroit Red Wings and Chicago Blackhawks and thanks for including the snow adventure links. I, too, had that “enough is enough” moment, HJ. And I laughed pretty hard at your ice-in-the-drink joke. Thank you for your wonderful visits and comments, my friend — always appreciated. Well I enjoyed watching the skaters on the other side of the fence, but I liked being on my side of the fence. ha. I hope your week is going well, dear Nan. Very interesting post, Jet. I have to tell my daughter, who lives in Oakland area, to look for it. I don’t supposed they have ice fishing too? I chuckled at the ice fishing question, Helen. Give it some time, and someone will figure out how to create ice fishing in California. lol. My thanks for your visit and comment — and best wishes for a great 2017. I smiled throughout this post, Jet. Our stories regarding skating and winter are very similar. I also used to skate, and even play ice hockey with the guys, on wide open frozen lakes in my youth in Northern Europe. And I still remember the biting cold waiting for the school bus when my breath almost froze on my face. Now I just like to take pictures of snow, for one or two days max 🙂 But it’s great that people in warmer climates can enjoy this winter sport too! I love that this post gave you smiles, Helen. It makes me smile to think of you in biting cold days in northern Europe as a youth, and your warm Florida days at the salt marsh now. We’re on the same page there. Thanks so much for this lovely comment and visit. Great post Jet full of personal memories and worldly knowledge. I grew up in Boston where the ponds froze in winter. The boys all played hokey and the girls dreamed of becoming figure skating stars. Cold, but a whole lot of fun. We had a bit of snow about a week ago. With temperatures below freezing the inch or two of the white stuff stuck around in the shady spots until a warm rain finally wiped it clean. Like you, I think snow can be truly beautiful, but I’ve had enough to last me for the rest of my life. Commuting miles across the Utah desert was no fun with whiteouts to add to the adventure. We have an outdoor skating rink in downtown Los Angeles… it can be so odd when there is brilliant sun and 80 degrees but I love to watch (as opposed to trying it myself!). I, too, love to watch. It becomes mesmerizing after awhile, watching them all circle and circle. I like hearing from a southern Cal perspective, and how wonderful to hear from you, Roslyn. Thanks for stopping by. I’m a San Francisco native and this is my favorite rink to skate in. I can’t wait to read your book and see what you have to say about the city. I am so delighted to hear from you, Lyvly Bee! Thanks for letting me know of your love for this rink. I embraced many SF natives during the writing of my book, and I imagine you will connect with it…I hope so. Have fun!